Have you ever been stuck in a situation where even after spending loads of money on online advertisements you are not receiving enough traffic? Well, if you relate to this scenario, you probably have a leaky bucket. Leaky bucket means your ‘bucket’ is unable to retain water no matter how much you are pouring into it. For almost all e-commerce businesses, one of the biggest problems is people adding products to cart but abandoning them during checkout. This can happen due to a lot of reasons. Some of them are complicated checkout process, unexpected additional costs or failure of the payment process. Sometimes, users are just browsing on the internet and are not willing to buy a product right away. More about this in the later section of the article. According to a report by SaleCycle, around 75.6% of the users put items into their online shopping cart and then leave it there without completing the purchase. This isn’t a new phenomenon. Sadly, over the years, this number is constantly increasing. If you think about it, that is a lot of potential revenue lost. Cost of shipping: Most of the people don’t feel like buying a low-cost product online because of the hefty shipping charges. For example, if a product costs $2 and shipping is $5, people refrain from buying it. Cost of order became too expensive: A lot of times, people add a lot of low-cost items in the cart while shopping online. However, they are put off when they see the actual order total. The hassle of return: Most users refrain from buying apparels online because of the difficult and time-consuming return process. If you are selling things online, you need to make your customer know that it will be easy for them to get a refund if they are not satisfied. Lack of payment options: If customers don’t find a payment option that suits them, they will probably not buy, no matter how much they like a product. Security concerns: With the news of various cyber attacks floating in the air, customers think a thousand times before entering their credit card details on a web page. Though the problem is intense, all hope is not lost. 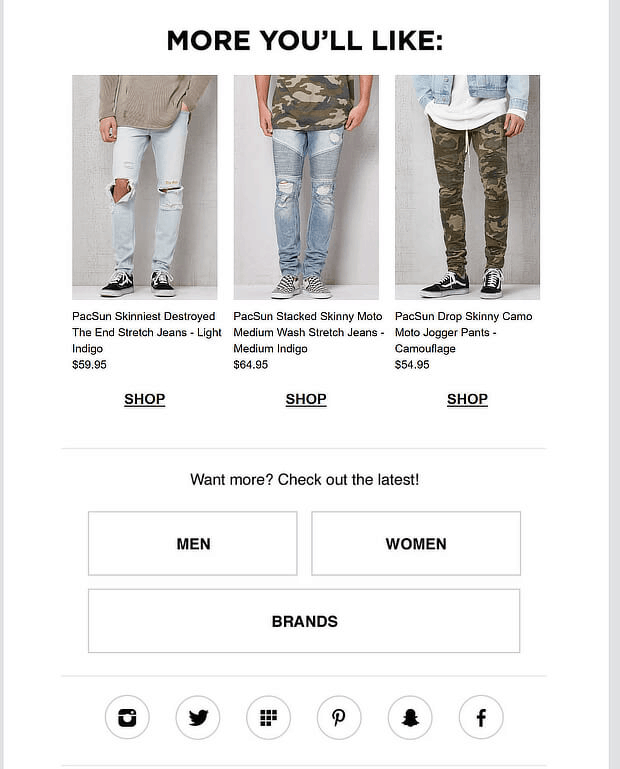 Retailers can still reach out to their customers and get the purchase with targeted abandoned cart emails. This is a very effective type of email that you can send to your prospects to boost your revenue. Before digging into what abandoned cart emails let’s look at some statistics. 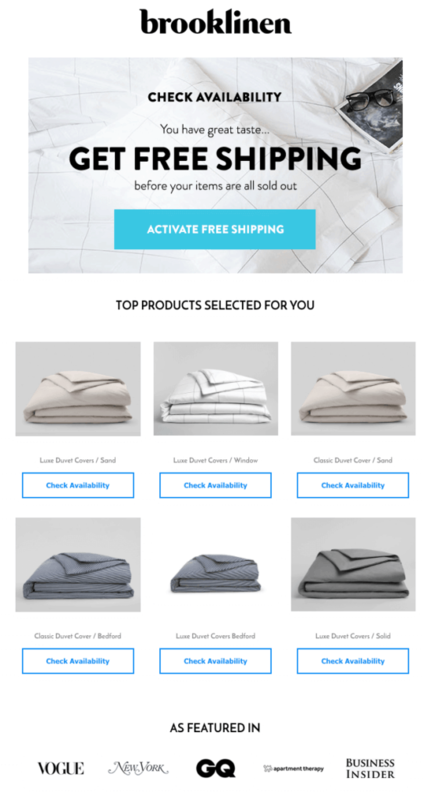 BigCommerce conducted research in which they found that average revenue per abandoned email is $5.64 as opposed to $0.02 per promotional email, and $0.18 per welcome email you send. Now that we have got you interested in something called abandoned emails, let’s take a deeper view into what it actually means. What is an abandoned email? It is a very popular eCommerce term used to describe an automated email sent to customers who leave your website after adding items to the shopping cart but don’t actually proceed to check out. 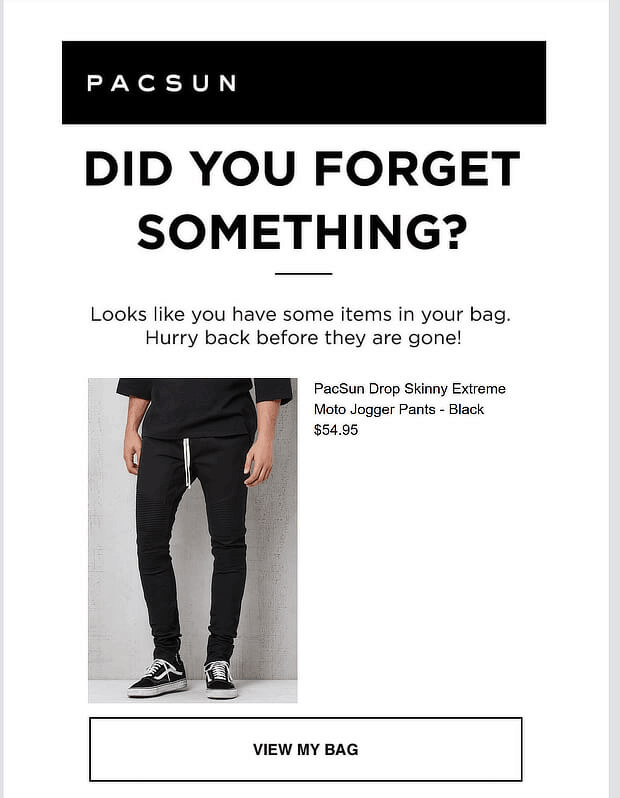 They basically assist in reminding customers of items they left in the cart and encouraging them to make a purchase of a product they were so close to buying. These emails are also sent when the customer cut the checkout flow. To send an abandoned email, you will need the shopper’s email address. For this, you can make it mandatory for users to enter their email before starting the purchase. If the customer has already subscribed to your list or is an old customer of your company, you can easily send an abandoned cart email to them. 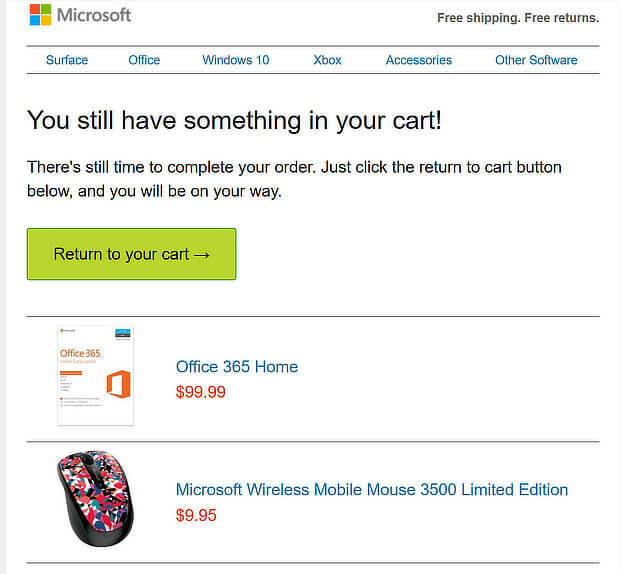 Abandoned cart emails work because unattended items in cart do not necessarily mean a customer’s lost interest in a product. Most of the times, it is some obstacle that prevented customers from going through with the purchase. How to write abandoned cart emails? Once you understand the fact that most people who visit your site will not finish the checkout process, you will see an abandoned cart as an opportunity rather than a problem. After all, people who did not complete the checkout process did something very important; they started it. This definitely clears the fact that they are interested in your product but faced some problem during the process. In a way, this segment of visitors is probably the closest to buying your product. There are a few things that you need to keep in mind while writing abandoned cart emails. If you include these features in your automated response, it will definitely help you boost their effectivity. The subject of your email is obviously the first thing that your users will see when they open it for the first time. It is extremely essential to grab their attention here or else they probably won’t even view the rest of the email that you worked so hard to create. Without fail, ensure that you include the user’s name in your subject line. According to a report by Klaviyo, abandoned cart emails that include customer’s first name saw an opening rate of 41.67% which is around 1% higher than those whose subject lines didn’t have a first name. However, sometimes, you may not have their first name if the customers just decide to provide their email address and nothing more. In such scenarios, you can use “Hey There” or a more personal greeting along those lines. 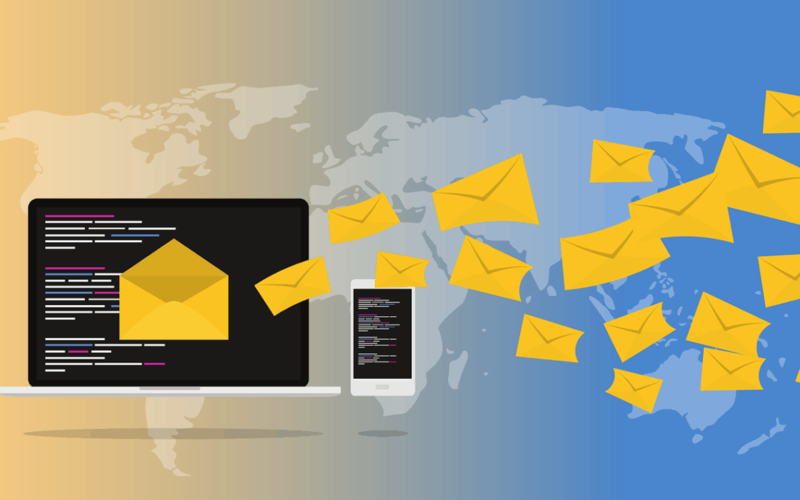 In order to personalize the email more, you can send an email from an account with an actual name attached to it instead of organization centric emails like info@companyname.com or contact@companyname.com. Using emails like james@companyname.com will give an enhanced personal touch and make your user feel that they are interacting with a real human being. Alternatively, you can also create a sense of urgency so the cart abandoners take prompt actions in any of the following two ways. This is an example from doggyloot.com that urges you to take action before the cart gets discarded. The following example of ModCloth informs users that items in the cart are about to sell out. Or you can give your users a friendly reminder the way Microsoft has done in the following example. Sometimes, you can just use humor to grab the attention of your customers. Check out this example of Forever 21. Sometimes, using humor can backlash if your audience doesn’t expect you to be humorous. So use it accordingly. Ensure that your subject line is of appropriate length. If it’s too long, users won’t be able to read the complete message and so might just not care. On the other hand, if it is too short, you won’t be able to tell the value the message bundled within the email. Here are a few examples which follow the format stated about. The following example has more textual content which is a great way of engaging customers. The content will definitely put a smile on your face as you read through the mail. This email is more concise and to the point. The image has very little text and delivers the message is no time. Also, notice the small compliment included in this email. Though the compliment here is transparent i.e “Nice picks, btw” will basically fit anywhere no matter what the person puts in his cart, it is still a nice way to get the customer back in the mood to make the purchase. 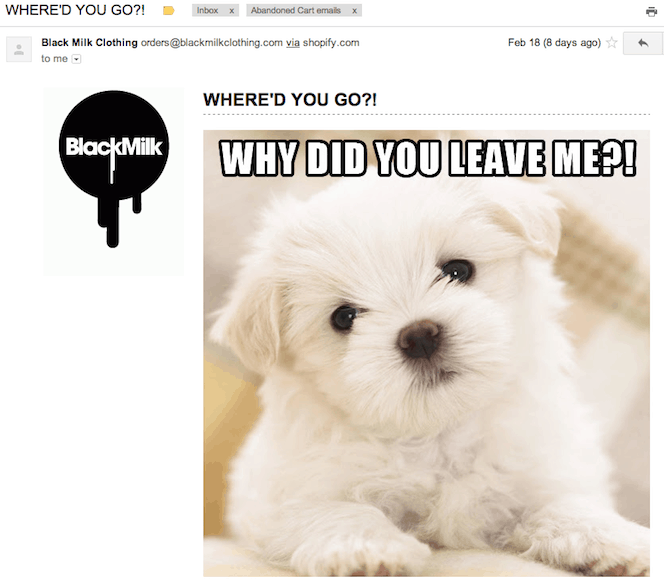 It is very important to include images in an abandoned cart email. Sometimes, people are just in a hurry and don’t wish to spend more than 5 to 10 seconds on promotional emails. In such scenarios, images will not only make your content attractive but also deliver the message in lesser time. Check out this example from Poo Pourri. Though most of the content is image-centric, notice the humorous wordplay. The email is very simple and focuses on the single item they left in the card. Visual marketing makes the email more personal and skilfully reminds the customers on what they are missing out on. This is a great example where the abandoned item is the hero of the email. 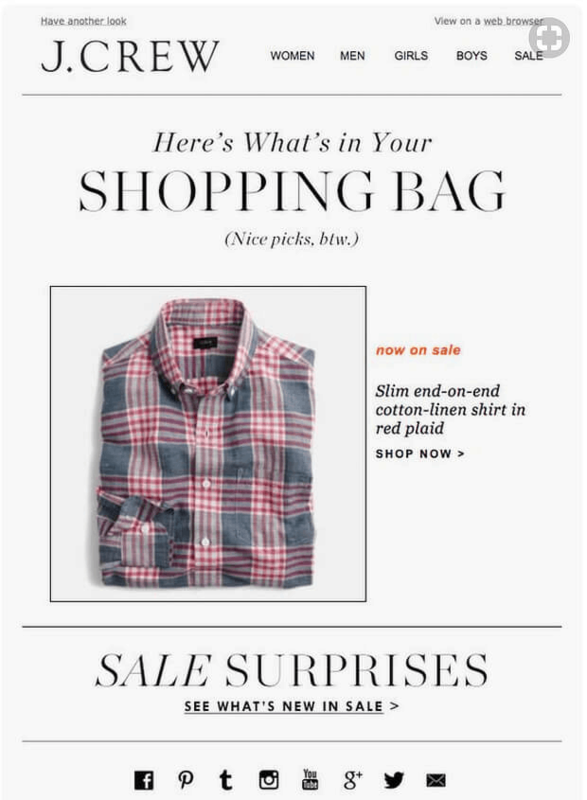 Irrespective of the tone of your email (comical, serious, cheesy), it should basically make customers re-interested in the product and convert the same into a purchase. It is extremely essential to take users back to to the page from where they left off. If you don’t provide a link to the shopping cart within the body of your email, no matter how good your abandoned cart email is, it will not get converted into a purchase. Moreover, never put too many call-to-action buttons in your email. It may confuse the user and you might lose the only chance you had of winning the sale back. 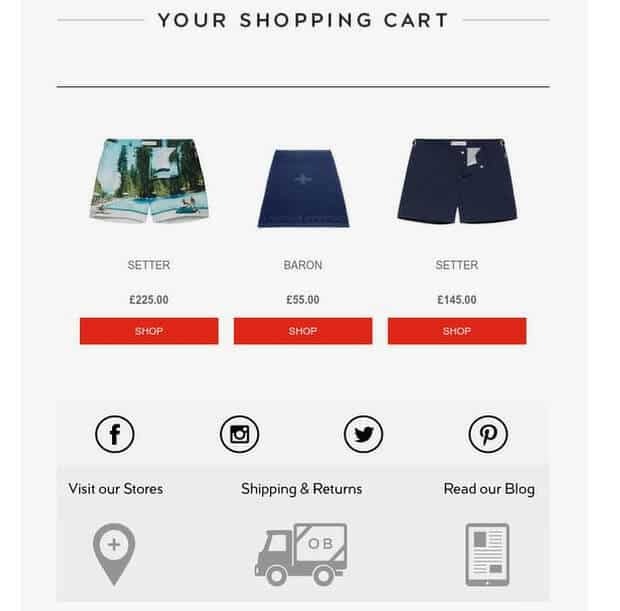 Though the email includes a number of links, including the ones redirecting to the various social media pages, different products, and different sections of the website, the main call-to-action button referring back to the cart is clearly visible right when the customer clicks on the email. 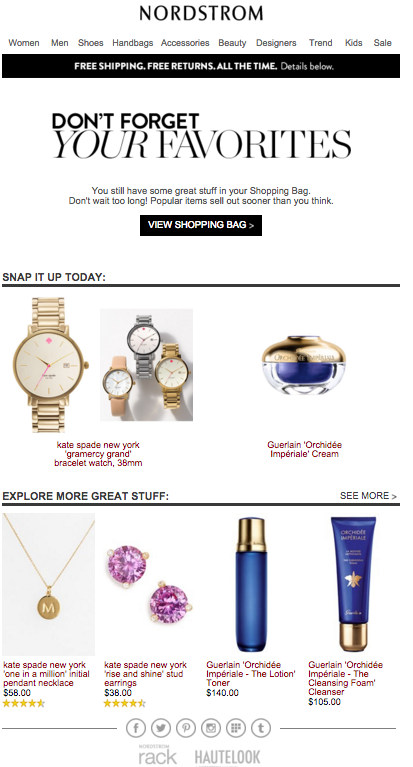 Notice how the email mentions that every link within the email goes back to the shopping cart. Though the email is visually pleasant, the call-to-action buttons are rather equivocal. It is unclear whether clicking on the “Shop” button will take a customer to the product page or their shopping cart with the described products in it. 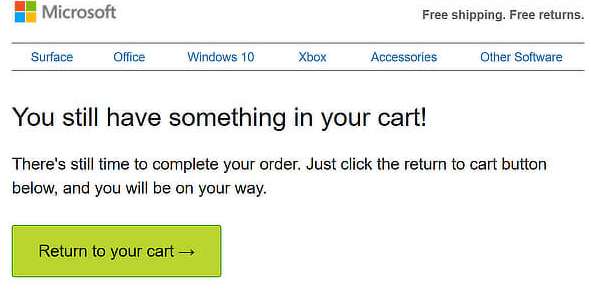 If the abandoned cart email itself is very confusing, it can probably curb the user from taking any action. Keep in mind that your main goal is to get the customer to continue the purchase they started off with. Any additional purchase you get is a sheer bonus. Though you might be tempted to include a ton of offers and showcase other products in the abandoned cart emails, it is beneficial to focus on one product at a time. As stated earlier, personalization can help you in better engaging with your customers. Though including the customer’s name and an intuitive greeting in the subject line is very important for personalization, these are not the only things that you should focus on. To further improve the relationship with a customer, you need to view their history with the brand and understand the reason behind what led them to abandon the cart. Along with reminding the users about their unattended cart, Nordstrom also recommends items similar to those in their cart. For every item in the cart, the company has provided 2 similar items which vary quite a bit in terms of their prices. Though not fully personalized, these suggestions are suitable for individuals with different budgets at their disposal. This email from Breadbrand looks just like an email that you would receive from your friends. It’s in plain text and the flow of information is just perfect. Notice how at the end, in the postscript, Keith tells Sam that she specifically liked one of the products in his cart and that it’s a great choice. Most of the times, you tend to purchase a product if you get your friend’s stamp of approval. We have already mentioned a bunch of reasons for customers abandoning their online shopping carts. However, to know exactly why the customer hasn’t completed the checkout process, you might need some detective work coupled with some guesswork. If you dig deep enough, you will not only solve the problem but also give a feeling to your customer that you actually care about them. Though your main goal is to get back the abandoned sale, you must take efforts to ensure that the customer purchased the product because you provided them with the exact value they were looking for. Solving such issues will not only help you win the sale back but also assist in deeper engagement with the customer in long run. Timing is very crucial while sending such emails to the abandoners. It’s imperative to send the first abandoned cart email within the first hour of abandonment. If you take too long to send your first email, you will probably lose the shopping urge that caused the customer to add the item in the cart in the first place. Generally, there are three types of emails that you can send to abandoners in order to win the sale back. The first email needs to be sent almost immediately after a user abandons the cart. In this example, you can show regret, ask them what went wrong and tell them that you are willing to help them out in case they need any help with the checkout process. The timing of the second email depends on whether an individual responds to your first email or not. If they show some signs of engagement, you can send a response within 24 hours of their taking action. If they don’t, you will want to send the second email within 24 hours of sending the first one. On most occasions, the second email contains a message of urgency, offers or discounts. Alternatively, if users respond to the first email, you need to address the issue in the mail that follows. Sending the third email is optional for two vital reasons. Sending too many emails can get your company blacklisted as spam. Moreover, if any user has not responded to the first two emails, there is no point in chasing them. However, still, if you decide to send the third email, you should send it only after 24-48 hours after your last interaction with the customer. Wrapping up, you have to realize the fact that most of your customers will abandon their carts. Also, a customer who has shown some interest in your product is always more likely to buy it than a new prospect. You can get the sale back by re-engaging the cart abandoners with the help of email campaigns which are not that costly. 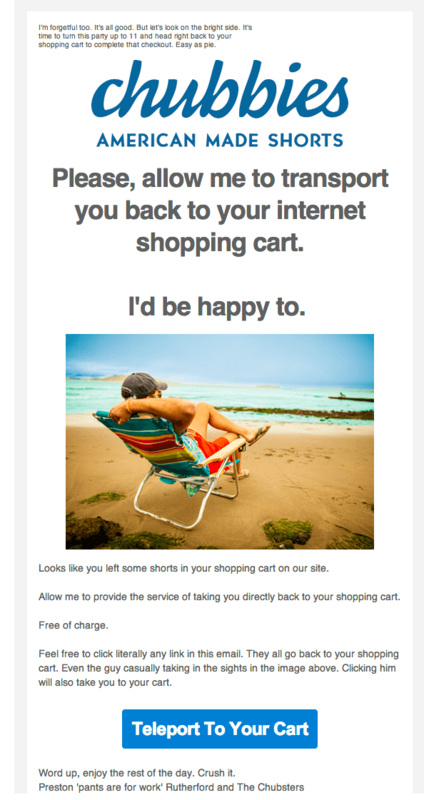 If implemented correctly, abandoned cart emails can generate a lot of revenue. If you drill down, find the reason why customers abandon their carts and take appropriate action, you will not only regain a sale but also gain their trust. Have you ever used abandoned cart emails for your business? Comment your views below.